If your home was built in the 1960’s or 1970’s, there is a good chance that electrical wiring might be using aluminum wire instead of copper wire. Since the mid-1970’s, only copper wiring has been used in homes because aluminum wiring poses a fire hazard. You might need to have aluminum wiring replacement done in your Douglasville home. Aluminum wiring can be a fire hazard wherever it is spliced or makes a connection with an outlet, switch, circuit breaker or other component of an electrical system. One reason aluminum wiring is such a fire hazard is because it shrinks and expands depending on the temperature. These changes to the aluminum wires can result in overheating, sparks and fires. 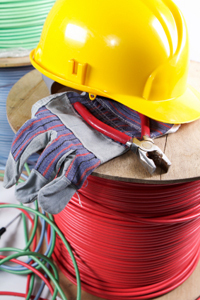 Due to such safety risks, you only want copper wiring in your home. Unfortunately, many homes in the Douglasville area still have this old, unsafe aluminum wiring installed. Our Douglasville electricians can replace your aluminum wiring with copper wiring and upgrade it for safety. At G & H Electrical Contractors and Consultants, Inc., our goal is to keep your home safe. We provide quality work with excellent customer service and finish your project on time and within budget. Call today for a free quote and consultation on your next aluminum wiring replacement!